So many aspects of life go unquestioned. A book is a book is a book. A duck is a duck is a duck. We do not have time to question everything in our lives. We need to take some things for granted. We require some degree of predictability. Routine can provide the platform for inventive and distinguished work. Frazzled folks make poor inventors, dancers, painters and managers. Deep thinking requires some respite from the details. It is time to question the book! But it is time to question the book. 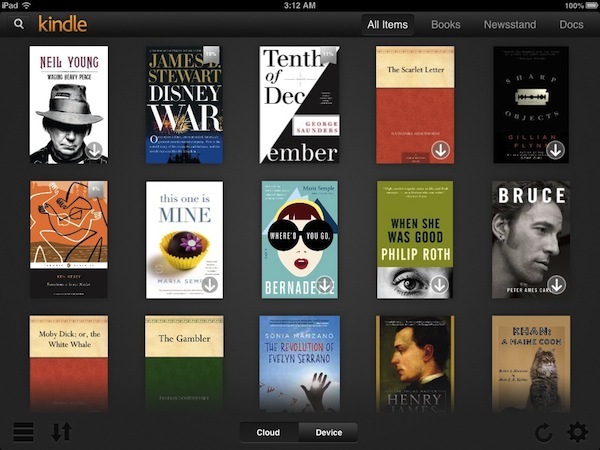 There is a sudden shift toward eBooks. Some of this shift can be explained by convenience factors like carrying a dozen books on a thin iPad or Kindle type device. 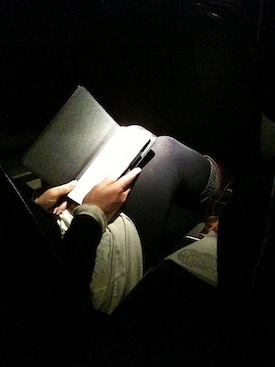 As I type these words on my iPad during a flight to Paris and then Siberia, I am surrounded by many passengers reading on a device rather than a paper book. It is about half and half. When I first began reading eBooks I was not smitten. Their format is often dismal. They are little more than paper books transported into the digital domain with a significant loss of format. The software used to convert print to digital usually damages the original page design painstakingly achieved for the print book. Having just converted a half dozen of my print books into Kindle books, I found myself groaning at the reduction in visual quality. 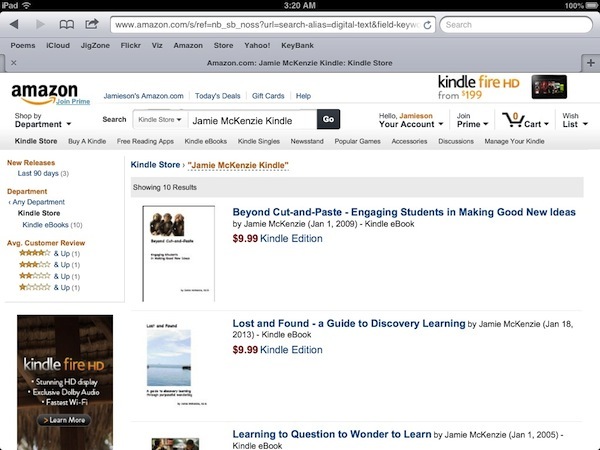 Click here to order McKenzie books from Kindle. It is the same with much reading of eBooks. They are generally not visually inspiring or pleasing. In order to work on a wide range of devices ranging from smart phones to iPads and laptops, format is sacrificed to generic scrolling words. 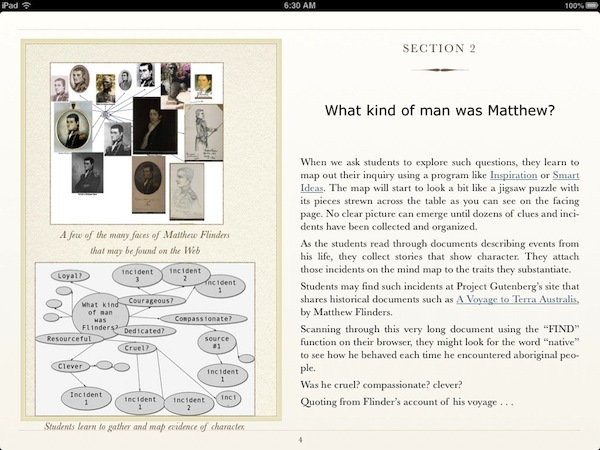 While this may be sufficient for fiction, much nonfiction reading is dramatically enhanced by the addition of visuals. 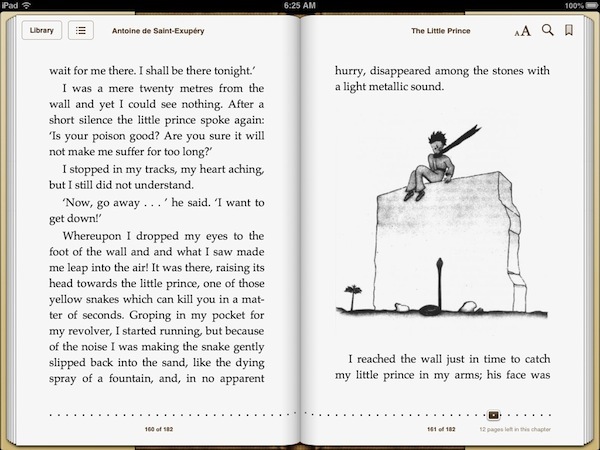 I can read The Little Prince as an iBook with drawings, but given a choice between the paper and the digital version, the print would win my vote. While most books available for eReading are merely ported over from the print world, there is an entirely new kind of book that is much more exciting and more promising. A page from my book, The Next Best Thing. 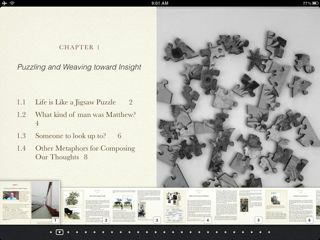 When Apple offered new software to support development of books that might exploit the impressive features of iPads, the future of the book changed. We have a new kind of book suddenly; only the offerings remain a bit limited because a book created using this software may only be sold for reading on an iPad. Not a smart phone. Not a laptop. So the financial rewards are somewhat limited. Most of the publishing world persists with the simple and cheap transformation like the ones I did with my own books using the Kindle software. 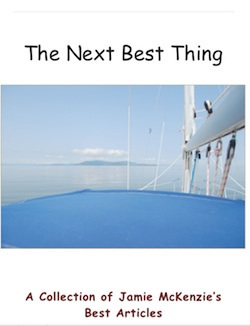 In part because I was curious to see what was possible, I created a book using the new software in 2012. 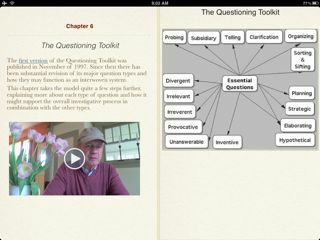 The potential of this iBooks Author software is impressive. 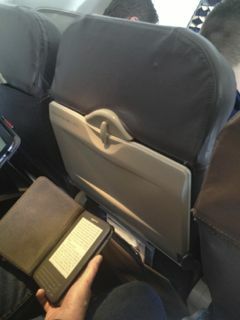 The new book has many features superior to eBooks that are mere transports. With this kind of software, the book changes into something quite different from printed books, and as the book changes, so does reading. You can enjoy a free sample of five chapters by clicking here. 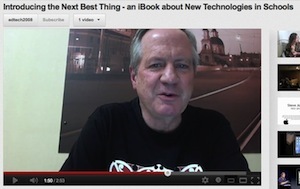 Listen on YouTube to ten of the more than 27 videos that are part of this iBook. What are the main enhancements provided by these new books? 1. They offer impressive visual experiences ranging from high quality images to videos. 2. Page design offers reading formats that are vivid and pleasing much like the pages of a great magazine like The New Yorker. 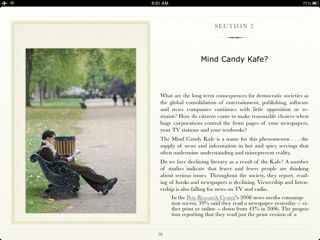 3. eBooks are directly tied to the Internet if the device is online, and iBooks offer embedded links that encourage the reader to explore resources outside the book itself. 4. 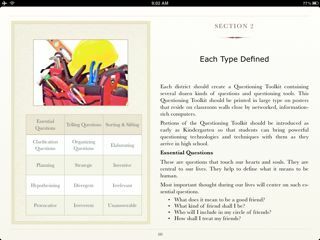 Note-making, highlighting and various kinds of marginalia are facilitated by eBooks but especially delightful in iBooks created with iBooks Author. 5. Words and concepts that are unfamiliar to the reader can be defined instantaneously by clicking on the word. Because of these features, reading is changing. 1. 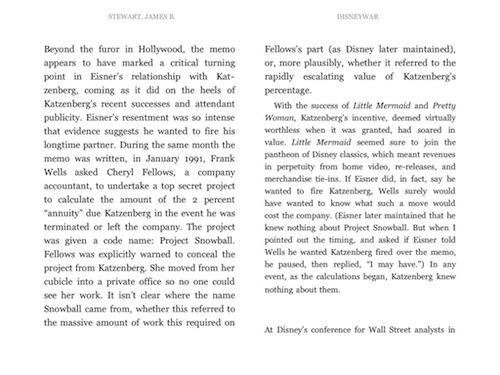 The reader may employ marginalia - knowtation - in powerful ways to increase comprehension. 2. The reader may take understanding far past words to include rich visual experiences. 3. The reader may expand on the contents of the book to explore many related enriching resources from the Internet. 4. The reader may quickly acquire related reading materials and enjoy them alongside of the original book. 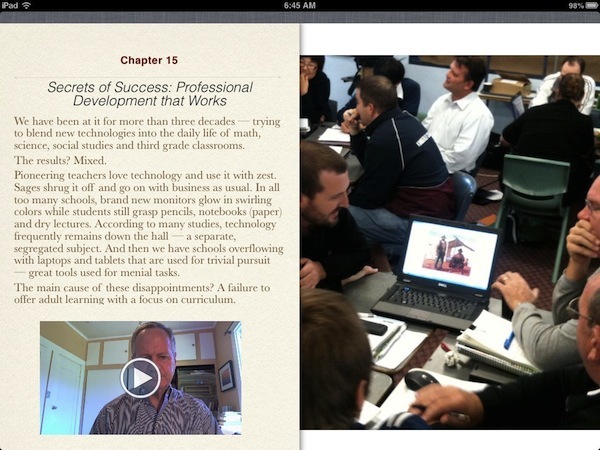 eReading - How is reading changing? FNO Press is applying for formal copyright registration for articles.